3 Toilet Problems SOLVED! 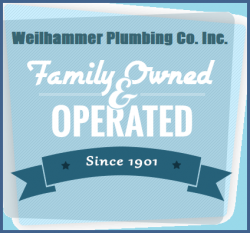 | Weilhammer Plumbing Co. Inc.
Our toilets are a modern commodity that we often take for granted. After all, most us of grew up in a time when indoor plumbing and contemporary bathrooms were the standard in residential construction. Although toilets have come a long way in terms of innovation and technology, they still have their problems from time to time. Of all the toilet problems that we experience, there seems to be 3 in particular that are recurrent among homeowners and renters: 1) clogged toilets, 2) running toilets, and 3) stained toilet bowls. Continue reading to learn how to easily solve these 3 common toilet troubles, including what you can do to ensure quality plumbing performance and longevity. Nothing’s worse than a backed up toilet. No one wants to be appointed to plunger duty, but sometimes, that is exactly what it takes to combat a toilet clog. If your plunger has a rubber flange (lip), be sure it is fully flipped open for optimal sealing. Don some rubber gloves (and if needed, a full-faced gas mask) and begin by inserting the plunger into the toilet bowl at an angle. Plunge slowly at first, picking up the pace a bit after a few thrusts. The water should begin to drain after 15 to 20 plunges; if it does not drain, you will need to switch to a different tool: a toilet snake. You have heard of drain snakes, which essentially pull out solid debris from clogged drains. Toilet snakes are basically the same thing, but for toilets. You may need one if the water does not drain after plunging it multiple times. Use the toilet snake in the same way you would a drain snake: insert it deep into the bowl, and then slowly pull it back. Do this a few times until something dislodges enough to drain the toilet water and eventually flush it again. If none of these methods work, you need an Indianapolis toilet plumber. Not only are running toilets obnoxious, they give you anxiety since the sound seems like the toilet is nearing a breakdown of some kind. Fortunately, it is quite simple to solve a running toilet problem. First, try wiggling the handle back and forth a few times. This may unhinge any kinks in the flapper within the tank, and stop the running. If this doesn’t work, open the back of the toilet tank and manually lift and release the cord that connects the flapper and flush valve. This should make the toilet flush, and then stop running. If none of these methods work, you may have a toilet leak, or you may need to replace the flapper or flush valve. In this case, you would need to contact a licensed Indianapolis plumber for professional service. Have you ever tried to scrub a toilet bowl clean, with no prevail? If so, you are just like thousands of others searching for the most effective and aggressive toilet bowl cleaner on the market. But the truth is, you can make your own toilet bowl cleaner that is just as effective, and perhaps more, than the products you can buy on the shelf. Below is a recipe to try. You will need a glass mixing bowl (plastic or metal will negatively react with essential oils), toilet brush, a wooden spoon, baking soda, some disinfecting essential oil of your choice, and 20% white vinegar. In your glass bowl, combine 2 cups baking soda and 1 teaspoon of disinfecting essential oil (tea tree, lavender, orange, etc. ), and use your wooden spoon to mix them together until lumps are gone. Then just add a spoonful of your powder to the bottom of the bowl, and sprinkle more around the inside of the bowl. Next, pour the vinegar over all of the powder, allow it to fizz up, and then scrub it with your toilet brush. Last, let the mixture sit for 15 minutes, and then flush your toilet clean! This entry was posted in Plumbing Service, Toilet Repair and tagged Clogged Toilets, drain a toilet, homemade toilet bowl cleaner, Indianapolis plumber, Indianapolis Toilet Plumbing, Indianapolis Toilet Repair, remove toilet stains. Bookmark the permalink.